Islay malts are known for their rich and flavourful characters. Usually this character is defined by powerful peat, smoke and fire tastes. Yet Islay also provides for those who occasionally fancy something a little less intense, without losing anything in richness. This is where Bunnahabhain comes in. Bunny, as it is affectionately known, is distinguished by its powerful malt, toffee and dried fruit flavours. It is often compared to digestifs and dessert drinks, for its decadent flavours and oily texture. The distillery has a maritime profile they are proud of, with a sea captain taking pride of place on their label. Bunnahabhain means the "the foot of the river", and the distillery gave its name to a local village, built expressly to house its workforce. Sheltered from the blasts of the windy North Atlantic by a natural cove, Bunnahabhain’s whisky reflects this tranquillity, offering soft, thick flavours in answer to the brash and bold peat of its neighbours. Of course, malting is what determines whether a whisky is to be peaty or not, and Bunnahabhain has an interesting malting arrangement. 90% of its malted barley comes from Simpson’s malting in Berwick, and the remainder from the Islay-standard of Port Ellen. This 10% is probably used in their new peated expressions. Other than this, all Optic malt they use is peated to a mere 2ppm, totally unapparent on the palate. This marks Bunnahabhain as unique on Islay as producing totally unpeated spirit, even Bruichladdich’s floral whisky is very lightly peated. The malt is then milled in a 1960s Porteous mill, before transfer to a single huge stainless steel mashtun. This is watered four times, with water drawn from the nearby Margadale River (which doesn’t flow through peat), at between 80-90Co, and churned by both plough and rake for full release of sugars. The distillery uses 6 washbacks of Oregon pine, to which the wort and Quest yeast are added. Fermentation occurs for 63 hours (shorts) and 80 hours (longs) heated at 18Co for weekends and 20Co for weekdays. The strength of the wash is between 6.5-8.5 ABV. Bunnahabhain has two wash stills, both about 8 metres high, with a capacity of over 35 thousand litres each (one of the largest capacities in Islay). The distillery uses the industry standard throughout the distilling process, with steam pans heating the stills. The Low Wines run goes on for about 5 hours, before the spirit stills are charged with the 26 ABV liquid. There are two spirit stills, roughly half the capacity of the wash stills, and a little shorter, at 6.35 metres. The distillery does use a quite short distilling timeframe, with the foreshorts run lasting merely 10 minutes, and the spirit and feint runs taking about 3 hours each. Bunnahabhain take a very small cut of the spirit, with an aim to ensure it is as unpeated as possible. The strength for storage is 68 ABV, and is mostly casked in bourbon barrels, but with some in sherry casks. These are stored in a mixture of dunnage and racking warehouses, of which there are seven. They close to the shore, giving Bunnahabhain its maritime qualities. 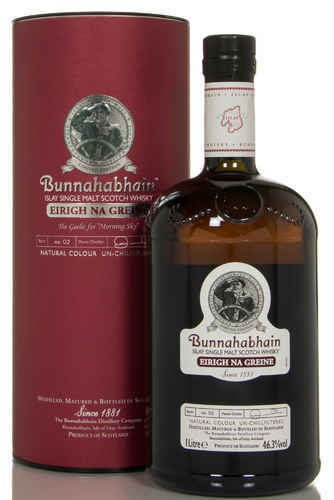 Bunnahabhain is a relatively recent distillery, opening in 1880 and founded by the Greenlees brothers. In 1888 the partnership was amalgamated with Williamm Grant and Co and became The Highland Distilleries Company. The distillery closed for 7 years in 1930, but then ran until 1963 when it was expanded. Until the 1970s, Bunny used purely for blends, with no single malt bottlings reaching the shelves, that said, some very old casks from before this time have been bottled. The distillery suffered, like many of its fellows, in the 1980s, and closed for two years between 82 and 84. On the cusp of the millennium the distillery was taken over by Edrington Group (owners of Macallan and Highland Park), which turned out to be a highly unsatisfactory ownership with pockets of activity in long periods of closure. That whisky that was produced was used almost exclusively in their Famous Grouse blend. 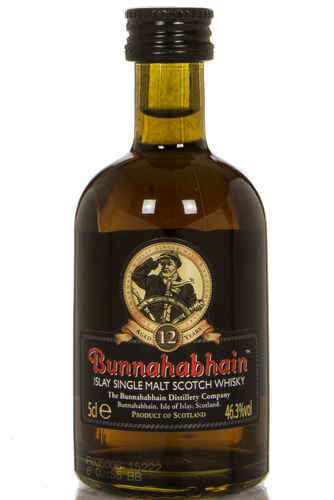 Finally in 2003, Bunnahabhain was bought by Burn Stewart Distillers, who also own Deanston and Tobermory. This period has seen a time of steady success, with the owners committed to establishing Bunnahabhain as a single malt whisky on the world stage. Rebranding saw a slightly more modern design, and a move to only Non-Chill Filtered expressions was welcomed by whisky drinkers. The range extends from the entry level 12 year old, to the 18 year old, up to the 25 year old. Recently Bunnahabhain released Toiteach and Ceobanach, both of which are heavily peated, and non aged stated, though the Ceobanach is at least ten years old. Both of these whiskies are throwbacks to the early part of the distillery’s history, when Bunnahabhain produced peated whisky. At travel retail there is another NAS expression Eirigh Na Greine, which means "morning sky", a fitting title for this red wine casked whisky. All Bunnahabhain releases are Non Chill Filtered, ensuring the oily character is kept intact. Whilst the standard range are all very fine whiskies in their own right, the 12 year particularly representing excellent value, there are plenty of older Bunnahabhains floating around for those discerning whisky drinkers. Particularly the 1968 Auld Acquaintance 34 year old has been thought of as one the best ever Bunnies, as has the 34 year old distillery bottling, and a pair of sherry cask expressions (34 and 35 years old respectively). There are some fine IB older bottlings to be had as well, and occasionally the Scotch Malt Whisky Society releases a cask. Most notable perhaps was a 40 year old bottling, released in 2012, and limited to just 720 bottles world wide. Bunny has some of the tallest and largest stills in the business. They also have one of the greatest capacities on Islay, in competition with Caol Ila. Casks of Deanston and Tobermory malt are also maturing in the Bunnahabhain warehouses, as there’s just not enough space on Mull! Bunnahabhain runs a local newspaper- the Ileach- that natives of Islay who have moved onto the mainland, or further afield, can register to receive. The cask of 40 year old was only discovered after checking an old pay ledger! Historically Bunnahabhain has been integral to many blends, including Cutty Sark and the Famous Grouse, but particularly the famous blend Black Bottle, which Burn Stewart also owns. It still forms a key part of Black Bottle.